Even if you’re not a broccoli fan, just hear me out. You have no idea what this will do to you. It will change your life and have you craving broccoli on the regular. This is where I was initially inspired. Originally published in 2007 by Elise from Simply Recipes, this recipe has been on regular rotation in this house since. She’s awesome. Pair this with anything – grilled chicken or fish, steak, or just eat it by itself. It’s that good. Feel free to tweak this to your taste – adding more soy sauce or ginger, or toasting the sesame seeds. Elise does toast hers, and I’ve made it both ways. I’ve literally eaten this broccoli for breakfast a few times because I love it so much. Now, check out my pretty glass bowl and serving tongs. This is what I stored my leftovers in. It’s the 8 Piece SNAP Glass Round Container Set and 2-in-1 Salad Server from OXO. They’re the bomb. 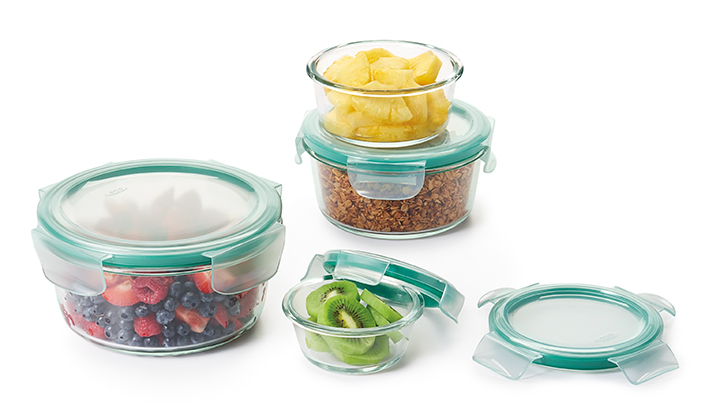 The glass containers can go from freezer to oven (without cracking or shattering) and have these amazing snap close plastic lids with four locking tabs and removable gasket that form a leak proof seal. They’re nestable and stackable, and easy to store in your cabinets. The serving tongs lock together at the bottom, and can be unsnapped and locked together in reverse for storage. Mix broth, soy sauce, sesame oil: Mix the stock, soy sauce, and dark sesame oil together in a small bowl, set aside. Sauté the broccoli, garlic, ginger by heating peanut oil in a large, coverable sauté pan over medium high heat. Add the broccoli and stir to coat with the oil, Sauté for about a minute. Clear a space in the middle of the broccoli and add the ginger and garlic. Add a little more oil to the ginger and garlic (about a teaspoon) and sauté for half a minute, stirring just the garlic and ginger, until fragrant. Stir the garlic and ginger in with the broccoli. Add the stock/soy sesame oil mixture to the pan, bring to a simmer and reduce the heat and cover. Let cook for 2-3 minutes, until broccoli is still firm, but can be pierced with a fork. 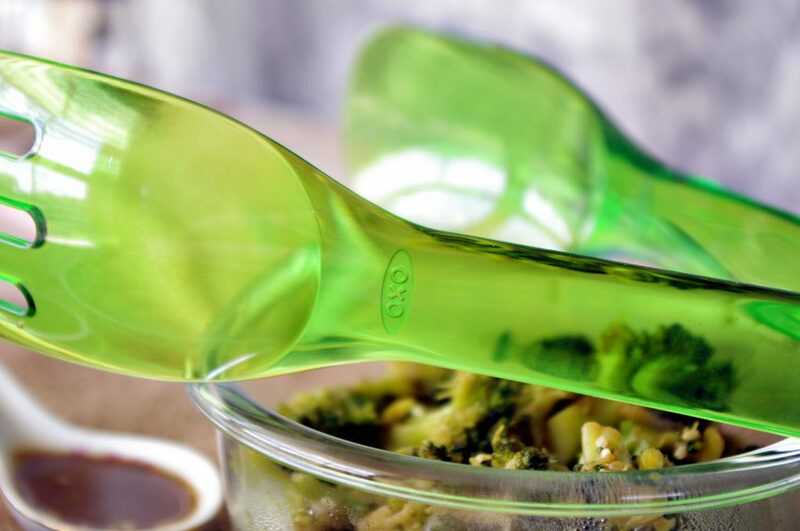 Remove broccoli with a slotted spoon to a bowl. Return pan to heat, increase heat to high and boil down the liquid until just a couple tablespoons remain. 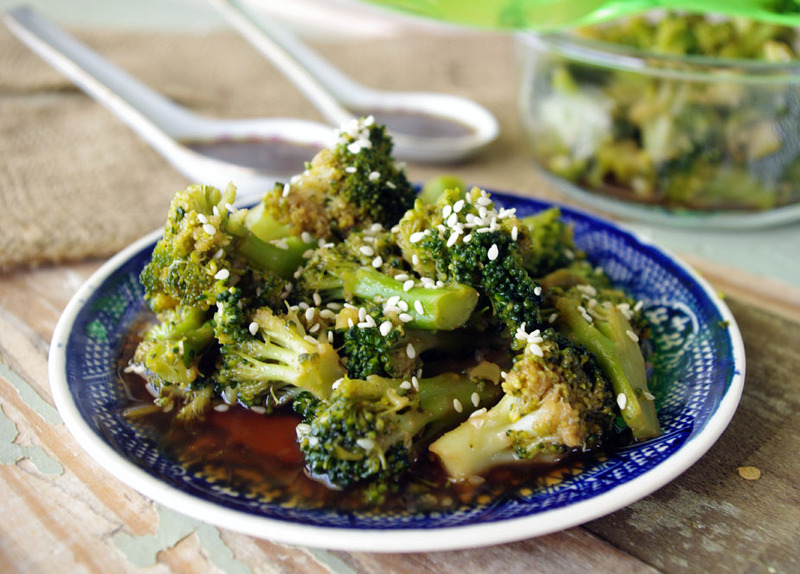 Turn off heat, return broccoli to the pan, add the sesame seeds, toss with the liquid and serve. 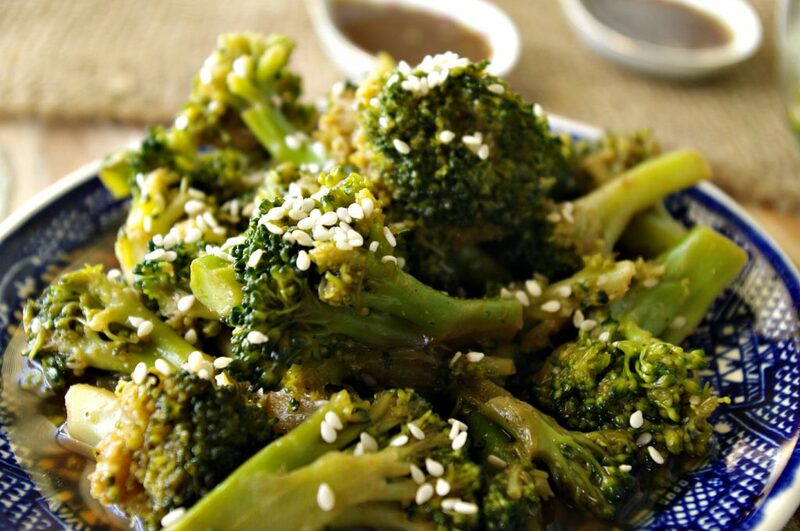 asian recipes, broccoli, broccoli recipes, ginger, sesame, sides, vegetable recipes, vegetables. Bookmark.